The warmer weather looks like it’s finally here to stay (at least for a little while), and this usually encourages us to get outside and make our gardens look presentable. Weeding, pruning trees and mowing the lawn can leave us with a large amount of garden waste to deal with. If sent to landfill, garden waste releases Methane – a greenhouse gas that is 23 times more harmful than Carbon Dioxide. It’s important that we look into other ways to dispose of our garden waste and this could involve reusing or recycling our grass cuttings, branches and more. The most obvious option would be to take your cuttings to your local green waste recycling centre. There are many recycling centres throughout Northamptonshire. However, you’ll need to look into which ones do and don’t accept green waste. If you don’t want to take your garden waste to a recycling centre yourself then you should be able to request a wheelie bin from your local council, if you don’t already have one. Some councils will charge an annual fee for this bin (you will need to inquire with your local council regarding this) and you will receive collections every fortnight in return. Alternatively, if you are an occasional gardener, you may be able to purchase garden sacks from your local council that will be collected as and when you have filled 3 bags. To make use of your garden waste rather than disposing of it, you could always begin composting. Composters, water butts and other products can be purchased from getcomposting.com who have teamed up with South Northamptonshire Council to provide residents in the local area with environmental products at a reduced price. Composting helps to provide your soil with nutrient-rich food, helping to improve soil structure and maintain moisture levels. Compost provides your plants with everything that they need to thrive including nitrogen, phosphorus and potassium. If you’re carrying out a large garden renovation project then hiring a skip may be the easiest and quickest way to dispose of the waste. 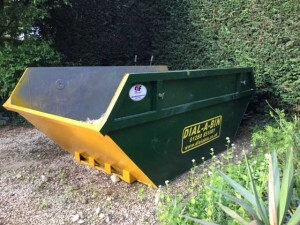 Dial a Bin have a range of skips available to hire in a variety of sizes throughout the Northamptonshire and Oxfordshire areas. We offer flexible skip hire periods of up to 14 days and can advise you on which items you can and can’t put into the skip. To find out more information please speak with a member of our team on 01280 878420 or get in touch via our online contact form.